Learn to sail in paradise and walk away with real sailing experience! Enjoy adventure and discovery for 2 days and nights! Visit top Whitsunday locations such as Whitehaven Beach, Hill Inlet Lookout and more! Walk away knowing the ins and outs of sailing! The Introduction to Sailing Course enables students to build their confidence and knowledge of yachts, learning both theory and practical, with hands on experience to master their new found sailing abilities. With small groups and a limited number of 14 students, the primary focus is on learning to sail. Beginners will actively partake in operating the vessel, receiving the best instruction and plenty of time to put into practice what has been learned. These sail training courses provide recreational and commercial qualifications which meet the National standards for commercial vessels (NSCV). The Introduction to Sailing Course will take place on board Eureka II, which is undoubtedly leading the way for modern sailing! Enjoy the thrill of fast sailing around the Whitsunday Islands during the day, and later retreat to the comfortable and beautifully appointed interior below. The trendy finish will truly leave you feeling like you are living the life of the rich and famous! The Introduction to Sailing course is great for beginners who have an interest in yachts and want to develop this further. For those interested in taking their introduction to Sailing a little further, check out the 5 day/4 night Commerical Crew Certificate for a more in depth course and sailing experience. Tap the hotspots on the floor plan below to view Eureka II. Guests on board Eureka II will get to enjoy a stop at the ever-so stunning Whitehaven Beach. Famous for its pure silica sands and seemingly endless shoreline, Whitehaven Beach has been voted one of the best beaches in Australia. It is located on the largest island of the 74 Whitsunday Islands, providing a perfect beach escape. A short bushwalk in land will lead you to the equally famous Hill Inlet Lookout, which will give you unparalleled views of the beach below and the swirling sands of Hill Inlet. The swirling sands below are created through the ever-changing tides that leave behind a kaleidoscope of blue and white. Capture this moment in a photo and in memory while on board Eureka II. The crew on board Eureka II will take you to all the hot spots in the area and provide you with all the necessary gear and tuition if you need it. Below the waterline the Whitsundays offers an array of colourful corals and amazing marine mammals and fish. The waters are a pristine blue and a beautiful temperature year round. Because of the low passenger numbers this vessel can get to locations that are more remote and off the beaten track so your guaranteed a unique experience without the crowds. HEADING SOUTH TO FRASER ISLAND? Package your Whitsundays and Fraser Island tours together and start saving $$! Talk to an East Coast specialist today. CALL 1800 550 751 OR LIVE CHAT US NOW! Please pack only a small soft bag (zipless bags only please) with: change of clothes for 3 days including t-shirts, sweatshirt/jacket (for colder months) hat, swimwear, beach towel, sunscreen 30+. Large suitcases/backpacks cannot be taken on board, please store these in Airlie Beach. Storage available locally from $5-10pp for the duration of your trip. 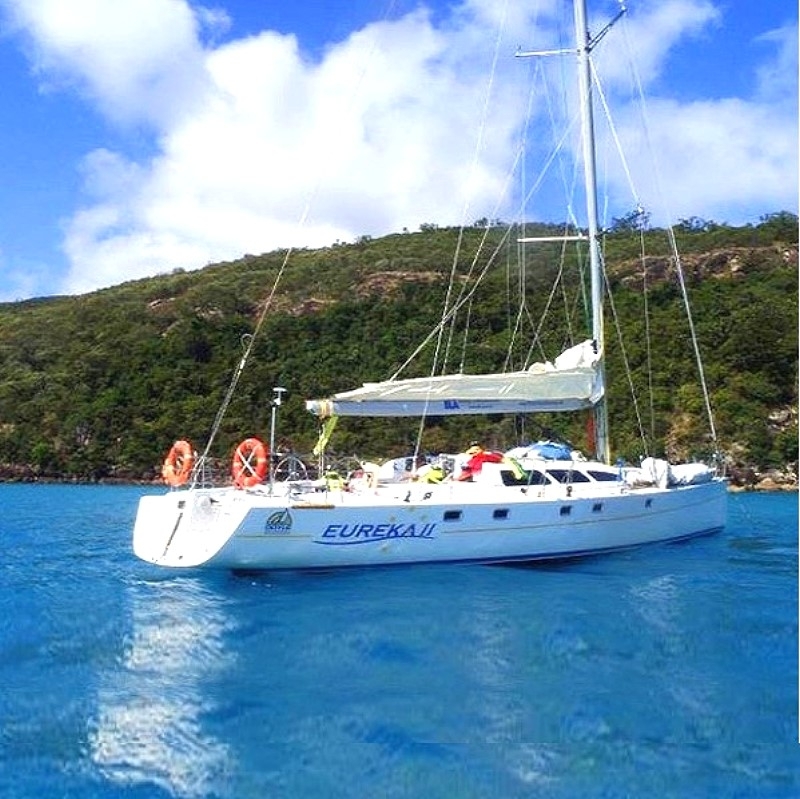 3 days/2 nights on board Eureka III including all Meals, linen, snorkeling equipment, all course notes, tuition and Introduction to Sailing certificate. Bring your own alcohol, any additional snacks/drinks. Excess luggage can be stored at several places in town for about $5-10 pp for whole trip. All cancellations forfeit 25% of total ticket price. All client cancellations made less than 21 days prior to departure will result in complete forfeiture of the full price of the sailing holiday. We strongly recommend that you have travel insurance especailly during the wet season.